Be the first to share your favorite memory, photo or story of Fredrico "Fred". This memorial page is dedicated for family, friends and future generations to celebrate the life of their loved one. 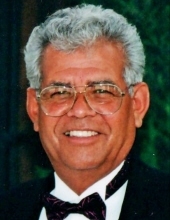 Fredrico "Fred" G. Barrera, 78, Grant Park, IL, died on Monday, November 26, 2018, at his residence. He was born on December 18, 1939, in Brownsville, TX, the son of Fidel and Eloisa Gomez Barrera. He married Patricia Hebert on April 26, 1964, in Chicago Heights, IL. She preceded him in death in April 25, 2008. He is survived by three sons and two daughters-in-law: Tom and Karri Barrera of Grant Park, IL, Fred and Colleen Barrera, Jr. of Hudson, OH, Greg Barrera and Carrie Kelson of Momence, IL. One daughter and two sons-in-law; Kristi and John Galvin of South Port, FL, and Richard Jensen on Momence, IL. He is survived by his sister Emily Hudson of OK and special companion Pamela Pochron of Grant Park, IL. One sister-in-law; Donna Barrera of Grant Park, IL. Also surviving are 15 grandchildren, and many nieces and nephews. He is preceded in death by his parents, one brother, Benny Barrera, and one daughter, Theresa Jensen. He was a truck driver and drove for Del Monte Foods. He was a member of the Momence Anchor Club. Fred was a woodworker craftsman and enjoyed selling his creations at various flea markets. To send flowers or a remembrance gift to the family of Fredrico "Fred" G. Barrera, please visit our Tribute Store. "Email Address" would like to share the life celebration of Fredrico "Fred" G. Barrera. Click on the "link" to go to share a favorite memory or leave a condolence message for the family.